There is a need to test how hospitals can cope with a high influx of patients from an incident or daily flow. The Emergo Train System Hospital set is used to evaluate a surge in the medical capacity of emergency department, surgery department and intensive care unit. A high impact on daily surge can influence the ability to maintain the normal quality of care. Decitions about prioritizations and medical ambitions are needed othervice patients' health will be at risk or worse, there will be a risk of preventable death. 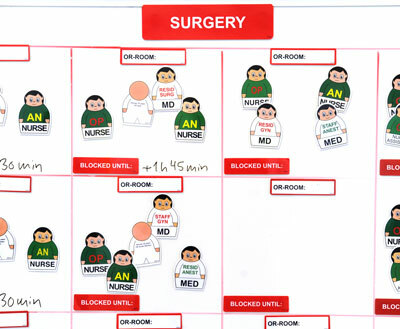 ETS Hospital set contains training material for setting up, running and evaluating hospital surge capacity exercises. 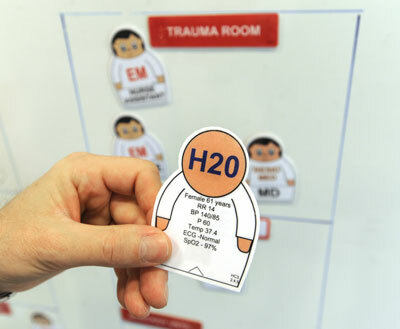 The set includes staff symbols (for doctors, nurses, other hospital staff), signs and treatment stickers. The set also includes in-hospital patients for the emergency department and the intensive care unit. The in-hospital patients can be evaluated according to surge capacity outcome and you can evaluate if the decisions made for the patient put them at risk and/or if hospital resources are overutilized. In-hospital patients can be purchased separately to add to your set. For further information, please contact the ETS Competence Center.